Most nice days, you can find Joe Satterthwaite and his French bulldog, Cocoa, playing catch and fetch on the grassy swath over the depressed Central Artery by Hanover Street. Former mayor of Boston Thomas M. Menino passed away Thursday morning at the age of 71 after a battle with cancer, less than a year after leaving his 20-year post as mayor. When Menino became Boston’s mayor, that area of the city was a dark, loud, nasty tangle of highway ramps and trolley tracks. But on Menino's watch, the old elevated Central Artery gave way -- billions of dollars later, and years behind schedule – to the Rose Fitzgerald Kennedy Greenway, a string of parks and public spaces from North Station to Chinatown. “It's been amazing because, honestly, there was a huge bridge here looking over at the North End, and it looked terrible,’’ said Satterthwaite, a graduate student and navy veteran. Menino didn’t actually build the Greenway – the old Turnpike Authority and state and private money did. But Menino absolutely shaped how it came together after the elevated artery came down in 2004, and banged heads when Greenway construction stalled to get Governor Mitt Romney and Turnpike chairman Matthew Amorello and state legislative leaders to get it back on track. In October 2005, Menino ceremonially planted the first tree on the greenway, and was a constant cheerleader for what the chain of vacant lots left by the artery depression could and should become. 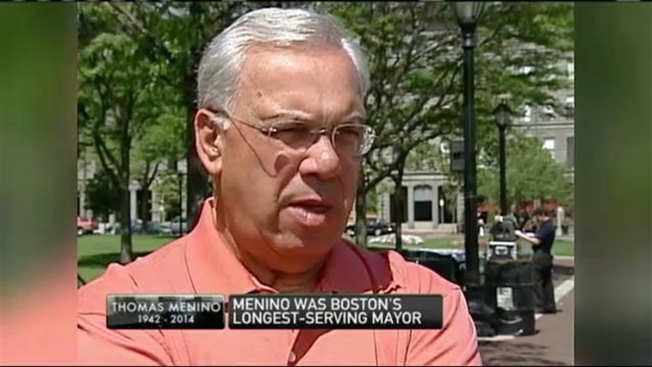 “This is a way for us to show off how far we've come and the possibilities we have,’’ Menino said at a July 2007 event. Menino helped wangle a big donation for the conservancy programming and overseeing the greenway from the person he’d likely call America’s second greatest mayor – New York’s Michael Bloomberg. By the time he left office, the Greenway had filled up with life, strollers, picnickers, and tourists flocking to its many and varied public spaces, inspiring hundreds of millions of dollars in new construction and renovation along its edges. With video editor Lauren Kleciak and videographers Marc Jackson and Daniel A. Valente Jr.